Who Obadiah was and when he lived is a topic of debate. There were many Obadiahs in the time of the Tanakh. Many of his words parallel prophecies from fellow prophets Jeremiah and Joel. Nevertheless, it is clear to whom Obadiah is prophesying. The content is rough, the tone is strong, the vision is ominous. Obadiah is a sad book because in it we see just how far brothers can stray from each another and how their respective families can evolve into violent enemies even when one side is at its complete lowest. The Bible begins with family discord. Just one generation after creation brothers are already killing each other. 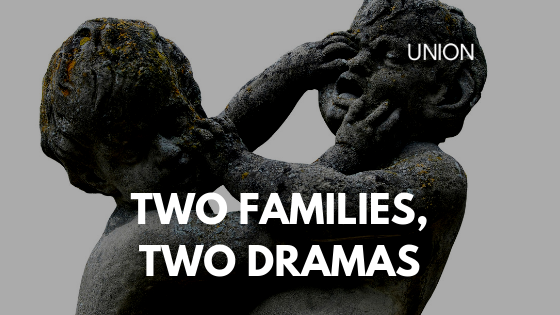 Even with the call of Abraham and the birth of redemption, we see family drama, leading to his family splitting. Jacob’s conflict with his brother Esau leads to Jacob fleeing for his life at the behest of his mother. The text doesn’t say it, but you have to wonder how much shalom bayit (peace in the house) existed in the home of Isaac and Rebekah. After 20 years of self-imposed exile Jacob makes his way home. Esau simultaneously makes his way toward Jacob. Jacob is accompanied by family, servants, and animals. Esau has 400 men. I don’t think they were his entourage on the way to Atlantic City. Now after 20 years of waiting and seething Esau has his chance at vengeance. When he finally encounters Jacob, however, irony explodes: Esau runs to meet Jacob, embraces him, falls on his neck, kisses him, and the two of them weep (Gen 33:4). For some unspoken reason Esau is elated to have his brother back. This is good. So, what happened? If you continue to read the parasha you come to the family tree of Esau. Notice a couple of big names: Amalek and Edom. We all know what kind of relationship the children of Jacob had with the children of Amalek. And, based on this week’s haftarah we see that the children of Edom didn’t have any regard whatsoever for the descendants of Jacob. It’s not like these were the Assyrians or Babylonians. In one respect, you can understand their animus towards Israel. When it’s family you have to wonder just what the heck happened. The somewhat cynical fact is that blood is not that binding. Again, look at the history of familial relations going all the way the back to its beginnings. Blood isn’t what it’s all cracked up to be . . . or should be. There is something, however, much stronger: the love and obedience of God. Those in the family of Messiah have a bond that is greater than anything coming from finite man. The eternal, life-resurrecting power of the Holy Spirit unifies us into a relationship that goes beyond that of blood. It is the ideal family, a family that loves, prefers others, repents, forgives, blesses, and seeks the kingdom of God. The Cleavers have nothing on this. Now, don’t get me wrong; for most of us, our blood families are great. We love them, love being with them, love eating with them, love telling jokes with them, love laughing with them—you know, family stuff. We, as children of the kingdom, need to see just how blessed we are in that we have another family, and just how important this family is. Esau and Jacob were brothers. The children of Edom and the children of Israel were cousins. Obadiah makes it very clear that there weren’t too many times in which the cousins got together, had dinner, and played cards. The fact is that while they shared blood they didn’t share God. As one progressed into the light the other became more and more comfortable in the dark. It is only inevitable that there will be a clash. Light and dark don’t make the best of friends. Yeshua warns us that as we approach the great day of the Lord, which Obadiah mentions as well (Obad 1:15), families will turn on one another (Mark 13:12–13). Why would they do this? Because of Yeshua. There will be a division between those who love Yeshua, obey his commandments, and do the will of his Father (see Matt 7:21–23, 12:46–50; John 14:15, 21) and those who don’t. Esau had his issues when he was with his family. There was a reconciliation of brothers upon Jacob’s return home. Maybe things were turning out for the better. We don’t know. But, we do know that eventually Esau left the family because space was tight (Gen 36:6–8). I have to imagine that due to such distance, not necessarily from his family, but from the presence of God that accompanied Jacob, the possibility of the events portrayed by Obadiah grew, developed, and became acceptable. We need to be close with our family of God, because that’s where God is! We need to see just how important this family is. We live in a culture where so much of our relating to God, be it in the body of Messiah and outside, is an individual experience. There is truth in this, but not outside of the context and relationships of family. We need to love our blood family. We need to honor them and serve and bless them. We need to pray for them and share Messiah with them. We also need to strengthen our family of God. Our blood families are strengthened as we do such. As we invest in our Spirit family the dividends pour into our blood family. As we spend more time with those of the Spirit we walk more by the Spirit. As we walk more by the Spirit the family drama we have will be how we grow from strength to strength, glory to glory. This doesn’t necessarily make great reality TV, but it does make for healing, wholeness, and peace.